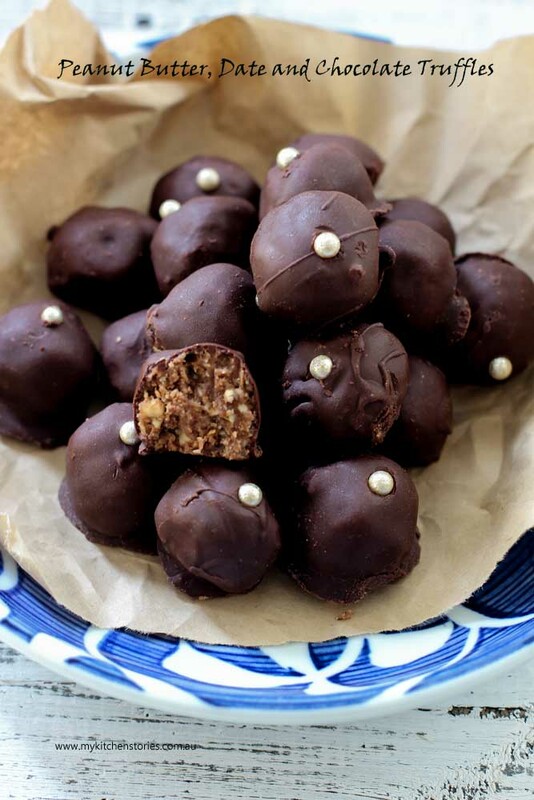 These are a bit like tiny Snickers bars and completely irresistible. They make a great gift or treat to take to a friend. 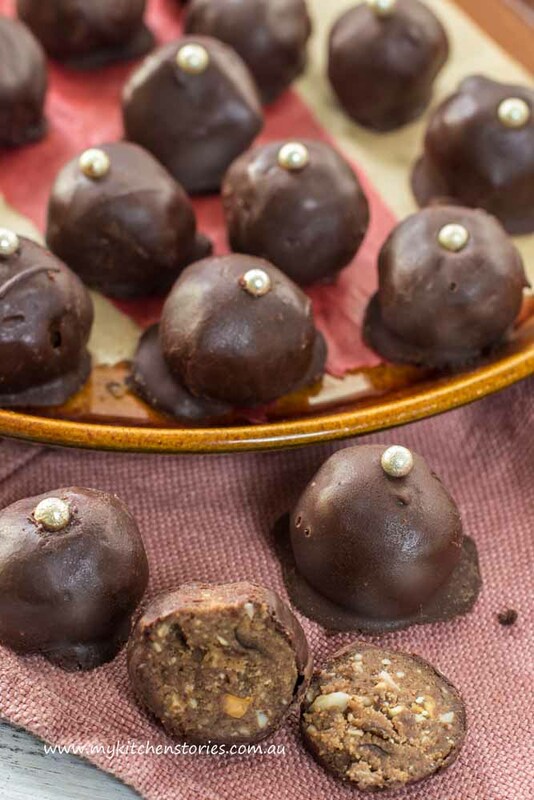 If you love peanut butter you will love these Peanut Butter, date Chocolate Truffles. I took a little break. I was really pleased that Skater wanted to come with me to Brisbane and Noosa on a little road trip to visit friends and eat in restaurants ( of course). Sure, he spent the Lions share of that time on his phone- Reddit, YouTube and car sales (a boy must research), but we spent some great time chatting too. The trip started with a bit of a drama that we just can’t help laughing about now, anyway. Do you trust baggage handlers? I always take gifts with me, food of course is de rigueur, but olive oil, balsamic, wine and rice can weight down luggage a great deal and with Skater along for the ride, I had to hunt down an extra bag. The one I found was missing a handle and I was concerned that all of the weight and bottles may become disastrous with baggage handlers massaging them in the gentle way they do. Skater managed to convince me that the thugs I imagined throwing my bags from the plane to the tarmac would most likely be very thoughtful and caring bag specialists so, I am not quite sure why, but I was assured by this new and naive view and packed all my goodies into the bag with one handle missing. I know silly right?. A friend of ours came to drop us to the airport and insisted on carrying my bag to the car. She picked it up by the remaining handle and swung it over the doorstep and the bag and the handle separated from each other. The bag went flying over the other side of the verandah. She was completely embarrassed and stood with her arm in the air with the handle curled in her palm. We all screamed in unison and all burst into nervous laughter. I insisted that she had done me a really big favour as I ran back into the house to hunt down another bag. I teetered on a chair and dug into the top of a cupboard pulling out a soft but passable bag. The three of us pulled everything out of the broken bag and put it into the new bag, being careful to keep the bottles and jars well padded and wrapped. The whole time poor Leesi was apologising profusely for breaking the bag and jeopardising our flight. The bag was repacked, and we jumped into the car and got to the airport with time to spare. She did me a huge favour but the poor thing felt so very bad. Imagine what baggage handlers would have done with my bag had they had the opportunity to throw it around! 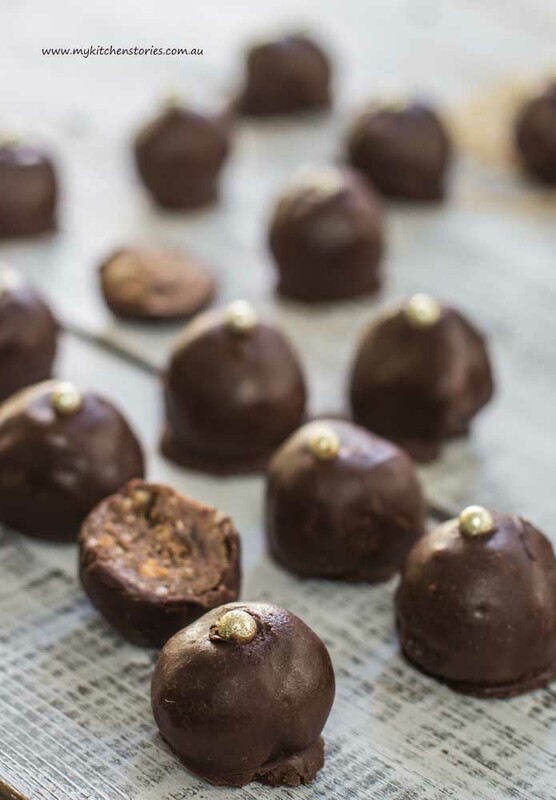 Roll into small even sized balls and line up on a baking sheet lined with paper. Chill. Add the extra cup of milk ( or dark chocolate if you like and stir till it all dissolves. This will temper the chocolate so it sets. 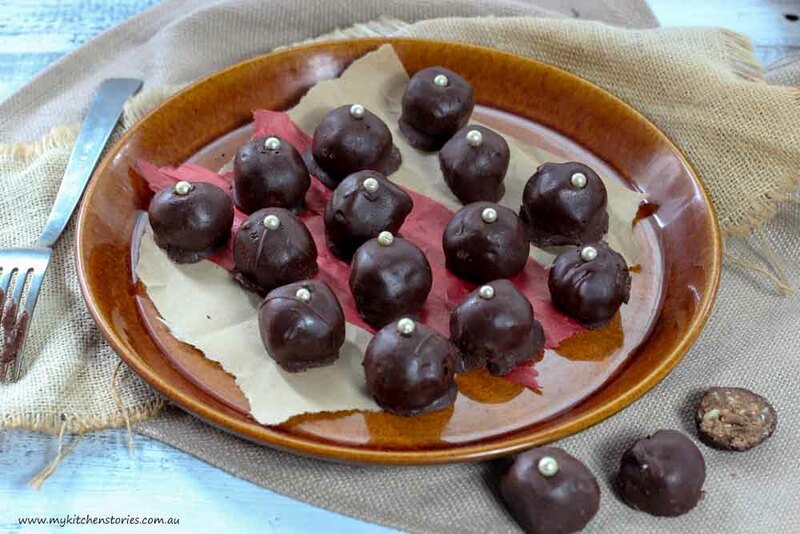 Dip each ball into the bowl of chocolate turning with a fork tapping off any excess. Put each one onto the tray and let them dry at room temperature or set in the fridge if you are in a hurry. Decorate with sprinkles or leave to dry and shave extra chocolate or cocoa over them. You are right not to trust baggage handlers, in my experience. He will be back next month, so I’m looking forward to some indulgent cooking. ERMAHGERD chocolate and peanut butter! Oh you can’t go wrong! You must have stuffed your baggage with lots of FOOD!! How could it break? :-! Those truffles look fantastic, Tania. By fresh dates, did you mean the raw one or those soft dried one? Yes indeed as usual the bag was stuffed full! These look terrific. And your luggage story did make me laugh. Am very glad it had a happy ending though! Oh don’t laugh Helen she’s very upset! 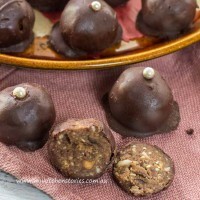 I love a good peanut butter and chocolate truffle, Tania, but you’ve elevated the treat to the divine. Adding dates is a fantastic idea and I bet a surprise to all lucky enough to sample 1 or 6.